Odds are, we've all eaten pretty well this week. Between the pumpkin and pecan pies, roasted turkey and vegetables and all manner of potatoes, you are, like me, very full by now. With that in mind, I'm definitely ready to turn the focus from holiday overindulgence to healthy moderation. And not only for myself. Last week in the Slow Food USA office, we took a moment to write a letter to our congressmen and women about the Child Nutrition Act which is up for reauthorization, likely in early 2010. Most of us support increasing the funding provided to each child by one dollar a day, so that the kids who rely on these meals have a chance at a healthy lunch and avoid the health problems that could affect them later. 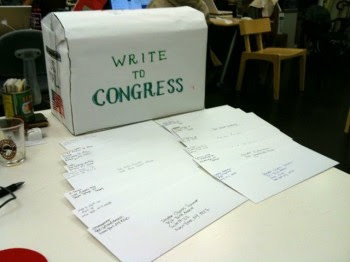 Check out the photos of us letter writing here, or the Slow Food USA Time for Lunch campaign here. And if you're interested in writing your own letter to congress, check congress.org to find the contact information for you local lawmakers. The biggest food holiday of the year just wouldn't be that without a least one culinary blooper. In our kitchen the turkey is still to be roasted and the gravy to be made, but my mom and I discovered our mishap last night around midnight. Weeks ago, we had decided to have pumpkin cheesecake for dessert this Thanksgiving. Neither of us had made a cheesecake before, but her good friend had a recipe and we felt up to the task. We decided that I would take the helm on the project, but at my parents' house since my mom's kitchen is better equipped. But when travel plans changed at the last minute, signals got crossed about who was responsible for the cheesecake. Maybe you see where this is going... Justin and I arrived at my parents house last night, bearing sweet potato casserole, veggies for roasting and a vat of pumpkin pie cheesecake filling. My plan was to run inside, whip up a crust, pour the filling in and take a nap before pulling the finished dessert out of the oven and stashing it in the fridge overnight. Instead, as I carried the liquid cream cheese mixture inside my mom spotted it and said, "Oh, wait. Did you make a cheesecake? I thought I was making the cheesecake." Sure enough, a finished pumpkin-spice cheesecake sat chilling in the fridge. The second is ready to pull from the oven as we speak. There are five* of us having Thanksgiving dinner this year at the Boggs' homestead, but we are determined that no cheesecake shall go untouched. That said, if you're in the mood for some dessert leftovers today, feel free to stop by our house. *We are short one Boggs family member today; my youngest sister is down south swabbing the decks, slushing the mast and whatever else it is you do when you work on a sailboat. It's an understatement to say that she is sorely missed. Wish you were here P.B. Lately I've been torn. 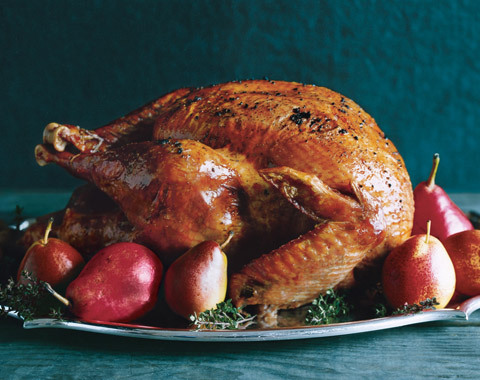 When it comes to Thanksgiving, there are certain dishes that I love for their steadfastness. 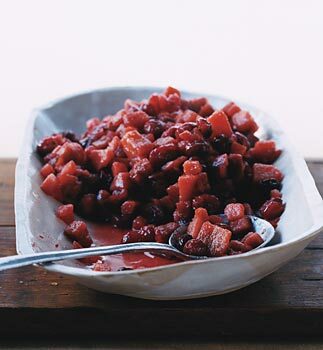 No matter the circumstances, these dishes are there, comforting me, year after year: my mom's celery-scented dressing, sweet potato casserole topped with toasted marshmallows, cranberry "sauce" straight from the can and, my husband's favorite, pineapple bake. Normally, I wouldn't look twice at these items on a menu, neither would I crave them unless it was the fourth Thursday in November. But when it comes to the feast to end all feasts, it wouldn't seem like a holiday without them. On the other hand, my palette has evolved over the years and I'm often tempted by the new, glittery Thanksgiving recipes on the pages of my favorite food magazines or blogs: cranberry relish with orange and ginger, cornbread stuffing with fennel and bell peppers or sweet potatoes with coconut milk and fiery Thai spice paste. I spend weeks plowing through these twists on the traditional sides, dreaming up an ideal meal. But I can't have it all. Our recent Thanksgiving celebrations have been limited to immediate family, so making a variety of sides that would include both the traditional and the modern versions of my favorite dishes would invariably result in eating turkey-day leftovers until Easter. Now normally, I'm not one to knock a leftover, I often think they're the best part of any meal, but I have to draw a line somewhere, and that line generally falls somewhere around the time I put up my Christmas tree. So friends, I'm stuck. Stay with my comfort foods and avoid the angry mob who might come after me if I replaced our sweet potato casserole with a spicy cousin, or blaze a bold new trail of Thanksgiving eating? What do you do to balance the old and the new? Findlay Market in Cincinnati, Ohio is the oldest continuously operating market in the state, and it's also one of the most forward-thinking. Last year, facing a shrinking Ohio farming population and a growing demand for local produce in urban farm markets, Findlay Market manager Cynthia Brown and colleagues came up with a solution. They applied for a USDA grant and created the "Cultivating Healthy Entrepreneurs and Farmers" (CHEF) program; with the goal of turning vacant community lots into working urban farms, and in turn providing business opportunities for members of the local Latino immigrant population. In July 2009, Philadelphia journalist Daniel Denvir produced a story on the CHEF program for NPR's Latino USA. It's a compelling story, and I recommend a quick listen below. The CHEF approach is both innovative, inclusive and, to my mind, an excellent example of a creative solution that addresses a range of issues facing our communities and food systems. And there is better news. Though Denvir's story ran just last week, in the time since he produced it CHEF has received a $219,000 USDA grant to expand the program, and in August four more Cincinnati lots were donated for use as urban farms. So while in 2009 CHEF employed four farmers on two plots of land, the new grant will allow them to double their impact in 2010; training and equipping up to ten growers on six plots of land. As I've mentioned here before, it can be overwhelming to consider all of the challenges facing our food system and the people whose lives are intimately connected to producing the food we all eat. Programs like CHEF are a reminder that solutions do exist, and that it's up to us to put them in place. * A thank you to Emma Kirwan of Millstone Farm in Connecticut, for sending this story our way! A nice glass of wine with a pancake. Last week I had trouble sleeping. I tried relaxing with tea and a book, but eventually the only thing that lulled me to sleep was watching a marathon streak of 'Scrubs' episodes. After powering through the entire season seven in a just few very late nights, one episode stands out in my memory. It's Turk and Carla's anniversary, and Turk is obsessed with having breakfast for dinner, brinner, to celebrate. The storyline reminded me of a too-long-dormant love for eating pancakes and eggs after dark. Making a good brinner at home, especially when it's cold and rainy outside, is one of the most comforting activities I know. So when we were elbow deep in laundry late yesterday afternoon and Justin suggested an early brinner, I was immediately game. Not long after, I had slices of french toast on the stove while Justin scrambled eggs and fried bacon. We ate on the floor and watched the Eagles beat the Bears. Turk's defense of breakfast for dinner sums it up for me, "I just don't see what's wrong with having a nice glass of wine with a pancake." Though my own brinner involved a nice glass of orange juice to help ward off an oncoming cold, I can definitely relate to the sentiment... It's kind of hard to beat brinner. * In honor of sweet potatoes and turkeys everywhere, there will be new posts on Fresh every day this week. I am constantly curious about what other people are eating. After friends return from traveling, I want to hear about their favorite meal of the trip. If I call my mom at dinnertime, I want to know what she’s cooking. When I ran into a good friend shortly after she crossed the finish-line of the New York Marathon, I couldn’t resist asking for details on her pre-race meal, even as she stood doubled-over nursing a cramp. My friends and co-workers know that any mention of an interesting meal could illicit a number of follow-up questions from my end. I just can’t help myself… When it comes to food, I have a curious mind. 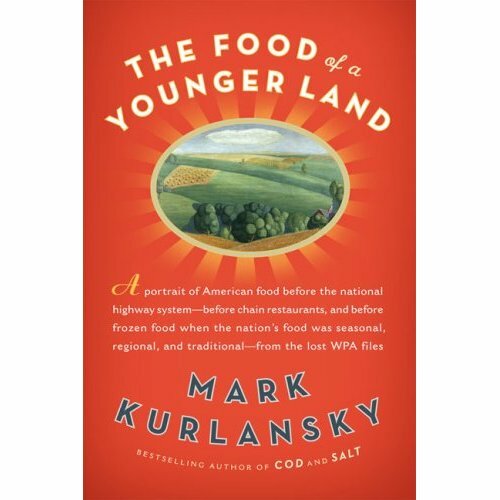 So when I came across Mark Kurlansky’s The Food of a Younger Land, based on the food traditions of the America my grandmothers grew up in, I felt I was the perfect audience. The collection of essays aims to be a portrait of American eating before our highways, chain restaurants and industrial farming made many of our dining habits homogeneous. And while I would disagree with Kurlansky’s perspective that our food traditions have all but disappeared, I won’t dispute the point that regional food is now something to be sought out; often buried under generic strip malls filled with Panera Bread, Chili’s and Chipotle. The many traditions that make up American eating have unquestionably evolved, and The Food of a Younger Land is an interesting reflection on where we’ve been. Following his earlier food explorations, Salt and Cod, Kurlansky’s newest came together by chance. While doing research on another book, he stumbled across hundreds of unpublished essays by the Federal Writer’s Project (FWP), a depression-era employment agency created by the Works Progress Administration. The essays were meant to be published as a collective guide to regional American food; America Eats. But just as writers were sending in finished (or unfinished) pieces in December 1941, bombs rained on Pearl Harbor and the country went to war. Funding for the FWP dried up and the project dissolved before the America Eats essays could be edited or published. As it turns out, this was at least one fortunate side effect of the war. Of the thousands employed by the FWP, a relative handful were legitimate writers and many of the essays that make up The Food of a Younger Land are drier than a high school history text-book. Other contributions are simply long lists of regional foods (though admittedly, I did appreciate the compilation of 1930’s diner kitchen lingo and will be looking for the next opportunity to use the line, “Burn one with axle grease Joe, I’ve got a blimp here waiting for a bellywash and an order of nervous pudding”). There are certainly a few good pieces of writing in the mix, like the husky recollection of cattle ranchers sharing Oklahoma Prairie Oysters and conversation around a fire; but for the most part Kurlansky’s introductions break up the monotony adding needed interest to the book. More importantly, the essays hold more interest and benefit for the reader today, in hindsight, than they would have at the time they were written. Looking back on the way we ate two generations ago is a reminder of how far our everyday eating habits have strayed from the regional and seasonal. Without question, traditional food preparations still exist. 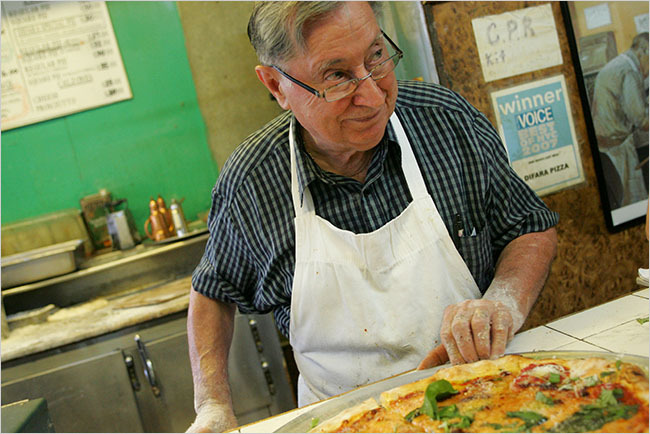 My visits to the North Shore of Boston always include a least one bowl of signature chowder, and a recent visit to Brooklyn’s Di Fara Pizza reminded me of the care and attention some people still devote to preserving their own food traditions. But Kurlansky reminds that in the not too distant past regional eating was the standard, not the exception. And without a conscious effort to maintain regional American food cultures, they could end up a thing of the past. I’ve been absent, but I can explain. I’ve been having an affair… With New York. I never would have guessed those words would come out of my mouth. Growing up an hour outside the city, trips into the Big Apple were required each time our relatives came to visit. I loved the time with my Southern kin, but I loathed those obligatory holiday treks into the heart of Manhattan. It meant clumsy train rides, more laps around the island on the Circle Line “cruise ship” than I care to remember, crowded elevators to the tops of the tallest buildings, shuffling around a freezing Rockefeller Center and, one time, losing my baby sister for about five minutes at the Empire State Building. She ended up being fine, but I was not. I was terrified of the city. To this day the smell of midtown, a mix of roasted street nuts and sewer pipes, makes me cringe. But my time in the Big City this fall has opened up an entirely different New York, one that I only knew existed a few years ago when friends started migrating to neighborhoods in the Village and Brooklyn. There are many, many things to talk about when it comes to exploring the city from the vantage point of lower Manhattan; the food alone is enough to keep us all occupied for months. Which, incidentally, is exactly what has happened to me. I have been fully consumed with consuming as much of the New York food experience as I can, and I’ve been doing it all on a shoe-string budget. Luckily, it turns out that a shoe-string is all you need for a little taste of everything. I’ve tried spicy falafel sandwiches and pumpkin gelato in the West Village, chocolate chip cookies and baguettes from favorite Brooklyn bakeries, ripe pears from the Greenmarket and cheese from Murrays', and the most memorable pizza I’ve ever eaten at Di Fara (that alone, is the subject for another post). This weekend, Justin is coming up and I could not be more excited to explore the city with him while tasting more of what the city has to offer. The good news is that Fresh will back with new posts next week, hopefully followed soon after by my old dress size. Enjoy the weekend everyone, and if you have a favorite NYC food spot to share we would love to hear about it here.